Ven. 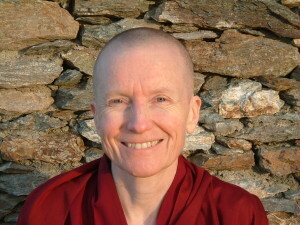 Sangye Khadro (Kathleen McDonald), a senior American nun, is currently in the process of completing the seven-year Masters Program at Istituto Lama Tzong Khapa (ILTK) in Italy. Before entering the program, Ven. Khadro already had extensive teaching experience and had authored the book How to Meditate and appeared in the Discovering Buddhism DVD series. Mandala interviewed her over email in April 2013 about the Masters Program and the benefit of in-depth study. Mandala: For our readers who are not familiar with your background, can you share a little about when you became Buddhist and your involvement with FPMT? Ven. Sangye Khadro: I started studying Buddhism in 1973 at the Tibetan Library in Dharamsala, India. In early 1974, I went to Kopan Monastery in Nepal and continued to study there, and was ordained as a nun in May 1974. I stayed in Kopan for three years – living in the community of Western nuns and monks under the guidance of Lama Yeshe and Lama Zopa Rinpoche – then returned to the West. Since then I have lived, studied, taught and done retreat in various FPMT centers around the world. Mandala: You had already established yourself as a teacher when you began the Masters Program at Istituto Lama Tzong Khapa (ILTK.) What influenced your decision to enter the program? Ven. Sangye Khadro: I had the chance to study Buddhist philosophy for about four to five years while living in England and France in the early 1980s, and I really loved it, but then I became busy teaching in centers and did not have much time to continue my studies. Several years ago – I think it was 2005 – I was doing a longish retreat at O.Sel.Ling Centro de Retiros in Spain, and some of the students of the first Masters Program who had recently completed the program were doing retreat there at the same time. I felt so happy thinking about how they had spent the last six years of their lives doing intensive study of the great Buddhist classics, and now they were doing retreat to integrate what they had learned. I found it easy to rejoice! I knew there would be another Masters Program starting a few years later, and I had the idea to do it. I have often heard His Holiness the Dalai Lama say how important it is to study the classic texts by the great Indian masters such as Asanga, Nagarjuna, Chandrakirti, Vasubhandu, etc. The Tibetan monks and nuns study these texts in their monasteries, and some Westerners are studying alongside them. But for those of us who do not know Tibetan, it’s not easy to find opportunities to do such studies. I wrote to Lama Zopa Rinpoche and asked his advice, and received a reply quite quickly: He said that it came out excellent to do the Masters Program. He also said that those who teach should do extensive study. So I signed up! Mandala: Seven years seems like a significant amount of time to commit to doing a program, especially if one has strong ties to a community and/or family that one would have to leave in order to do it. In other words, deciding to do intensive Buddhist study in Italy or France (Nalanda Monastery’s program starts in September 2013) is a significant life choice. What’s your perspective on making this kind of commitment? And what factors should a person consider when making this kind of decision? Ven. Sangye Khadro: Yes, some people might experience challenges – financial, living far from their homes and families, etc. But I think that if someone sincerely wants to do the program, they will overcome these challenges and find ways to complete it. There are various ways of doing the program – partial or complete, residential or online – depending on the different situations, needs, etc. of individual people. The program consists of five modules that are studied over a period of six or seven years – and students are free to do all of them, or whatever number they can. To complete the program, one must do a one-year retreat, but that can be done wherever and whenever one can. The best is to do the entire program residentially, but yes, it is a big commitment, and it’s not easy – e.g., the material is sometimes very difficult to understand. But I think it is worth whatever hardships one might go through, because you end up with a much better understanding of the Buddha’s teachings. Also, our teachers tell us that by doing such studies, you accumulate a vast amount of merit and purify a vast amount of negative energy. Some of my classmates met with Lama Zopa Rinpoche in France a few years ago, and he told them that out of the three types of preliminary practices – 1) doing 100,000 repetitions of the usual nine preliminaries such as prostrations, etc., 2) reciting the 8,000-verse Perfection of Wisdom Sutra 100 times, and 3) studying the great classic texts – the third is the best, or highest, way of doing preliminary practices. Mandala: What benefits have you experienced from doing the Masters Program? Ven. Sangye Khadro: The basis of our study and practice in the FPMT is the lam-rim – the stages of the path to enlightenment – and I feel that now I have a much better understanding of the lam-rim. The foundation, or source, of the lam-rim is actually Maitreya’s Abhisamayalamkara (Ornament for Clear Realization); this is the first text we study in the Masters Program. It’s very complex and vast, but very beautiful and inspiring, and explains the actual path one must follow to become a buddha in much greater detail than what is found in the lam-rim texts. The second text we study is Chandrakirti’s Madhyamakavatara (Supplement to the ‘Middle Way’), which is mainly about emptiness according to the Madhyamaka Prasangika school, but also contains beautiful teachings on all six perfections. One of our teachers, Geshe Tenphel, told us that in order to really understand the special insight section of the lam-rim texts (e.g., Lama Tsongkhapa’s Lamrim Chenmo) one should first study Chandrakirti’s text, and I find this to be true. Previously I had a hard time understanding the special insight section of the Lamrim Chenmo but now when I pick it up and read it, it seems clear and easy to understand! The third text we study is Vasubhandu’s Abhidharmakosha (Treasury of Manifest Knowledge), which contains a lot of very useful material. For example, the fourth chapter is all about karma; you see many quotations from the Treasury in the sections on karma in most lam-rim texts, indicating that this text is the source of those explanations. It also contains extensive explanations of the aggregates, sources and constituents – which comprise the basis of designation of our “I” – and learning more about these is helpful in one’s meditations on the emptiness of the “I” as well as on the emptiness of phenomena. In the final two modules, we study tantric grounds and paths and Guhyasamaja, subjects that are essential for one’s understanding and practice of tantra. So all in all, I think that doing the Masters Program is unbelievably beneficial for those who want to really understand, practice and teach the lam-rim path to enlightenment. Also, our teachers have told us that by doing these studies, we will understand more of His Holiness the Dalai Lama’s teachings. I have found this to be true as well, because when His Holiness teaches, he often brings in material from the great Indian classics of Asanga, Nagarjuna and so forth. So now, I do not feel so lost when that happens! Mandala: What do you see yourself doing next? Ven. Sangye Khadro: Retreat! As I said, we must do a one-year retreat to complete the program, so I plan to do that next year, and I am really looking forward to it. You can find out more about the Masters Program in the Education Services area of fpmt.org. The FPMT Foundation Store offers for purchase Ven. Khadro’s book How to Meditate and you can watch the video of module 2 “How to Meditate” from the Discovering Buddhism series online for free.